1. Combine all ingredients (except red onion) and mix together. 2. Place all ingredients in the large Vacucraft rectangle container. 3. Place red onion on top and let it marinate in the fridge. Note: recipe calls for 3 hours of marination (in regular container) however, since you own a Vacucraft container, your deliciously fresh ceviche will be ready in 45-60 minutes! 1. In the large Vacucraft rectangle container, mix the pineapple juice, brown sugar, mustard powder, ketchup, red wine vinegar, lemon juice, and soy sauce. Season with cloves, ginger, garlic, and cayenne pepper. 2. Cut ribs into serving size pieces and place into the marinade. Cover and refrigerate. Note: recipe calls for 8 hours to overnight marination. However, with your Vacucraft container your succulent ribs will be ready in just 2-3 hours! 3. 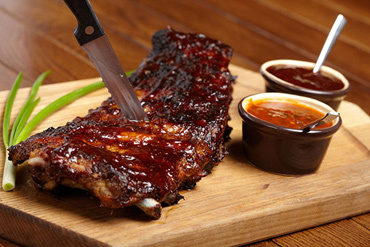 Preheat oven to 275 degrees F. Cook ribs in marinade for 1 ½ hours, turning occasionally to ensure even cooking. 4. Preheat grill for medium heat. 5. Grill ribs for 15 to 20 minutes, basting with barbeque sauce, and turning frequently until nicely glazed.